Dr. Praveenkumar Talikoti is an experienced Ayurveda in Baratgi Road, Bijapur. He has been a practicing Ayurveda for 6 years. 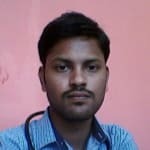 He has completed Bachelor of Ayurveda, Medicine and Surgery (BAMS) . He is currently associated with Dr praveenkumar in Baratgi Road, Bijapur. Book an appointment online with Dr. Praveenkumar Talikoti and consult privately on Lybrate.com. Lybrate.com has a number of highly qualified Ayurvedas in India. You will find Ayurvedas with more than 35 years of experience on Lybrate.com. Find the best Ayurvedas online in Bijapur. View the profile of medical specialists and their reviews from other patients to make an informed decision. When sitting alone I simultaneously speak to myself and I also struggle with mood swing get easily angered. Is this a symptom of any disease. These things may happen when you are stressed or in anxiety, depression and worries. With satvavajaya chikitsa it can be resolved. Take bhrahmi vati 1-0-1 saraswatarishta 10-0-10 for 45 days. Practice yoga and pranayama to control mind. I have done my blood test and my rdw observed 12 against the specifications limit 13.3. It's due to vata dosha effect which causes malnourishment of rakta dhatu. Take tab abhraloha 1-0-1 for 30dyas. Dashamularista 10-0-10 ml with water. Practice breathing exercises and yoga. I am sleeping too much I think. I sleep almost 9-10 hour a day. I am not able to wake up early. When I try to study something then also sleep came. Keep practicing pranayama and yoga. Set a routine to daily activities. Eat fruits and vegetables. Daily walk and exercise keeps you active. How to overcome through ringworm I had got this disease from 2 month I try many medicine but the disease go and again come back please help me it's very embarrassing. Drink plenty of water and keep your body clean with dust and allergens. Avoid spicy and oily foods, cheese and unctuous foods. Take bath twice with eladi soap. Manjistadi kashaya 15 ml with equal water twice. Apply panchavalkala lepa ointment. I'm using danabol ds for bodybuilding competition. Please tell me what should I take along with it to prevent liver and kidney. Dear Lybrate user stop taking that drug as it harms to bones and other vital organs. Take Nutritious food including fruits and vegetables.in order to increase bulk of muscles take naturally rich protein foods. From last one month I keep sneezing whenever I go out to sun or sit in front of direct air. I am not having fever or headache. Running nose full of water not cough. It's due to nasal cavity irritation, put 2 drops of coconut oil or pure cow ghee on each nostril before goin out. Drink water sufficiently. Take Agastya haritaki rasayana 1tsp thrice in day for 30 days. I am 61 year old female. My TSH result is .30ulU/ml and Hemoglobin is 6.5. What's should I do. You can follow below medicines Lohasava 15 ml with equal water twice in a day. Agni tundi vati 1-1-1 B/m. Unable to sneeze from last 1 month only sneezing sensation occurs but sneeze not came out what can be the cause and how much time it will take to cured or heal 2 month 6 or a year? What should I avoid in this case and what are some home remedies to cure this? It's because of vata dosha vitiation. It can avoided by practicing yoga and pranayama. Keep nasal cavities wet and clean. Drink water every day sufficiently to keep urself hydrate. Put one drop of coconut oil on each nostril everyday before outing. How can I forget a bad thing that happened in my life? I cannot even concentrate on anything because of it. Involve your self in busy activities, sports and spiritual meetings and functions, doing yoga and pranayama taking balanced diet will make you forget about bad things.